On this warm April morning, as I stayed with her for almost an hour at Mere’ Monique Home, my beloved aunt, Sister Mary Ignatius, kept on singing repeatedly, the poem “Trees” by Joyce Kilmer. She is now 82 years old. We held hands. Her hands, now with traces of wrinkles, are the hands that used to hold me steady when I was learning how to walk, the hands that held on to my arm when we crossed the street, the hand that held a pen to write me letters of wisdom. One by one, I touched her fingers. These fingers, I still could vividly remember that at one point in time poked my dimpled cheek, or traced the form of my face. Unknowingly, tears started to form at the sides of my eyes and trickled down to my cheeks. All the bottled emotions overflowed, as I sang with her. It has been 4 years since I last saw her. Much as I wanted to visit her more often, the distance from where I live, is a hindrance. But every time I get the chance to take my vacation, I always find time to visit and spend precious time with her. As I look at her, I cant help but ask myself: “where did all the time go?” I could not help but turn back the hands of time. 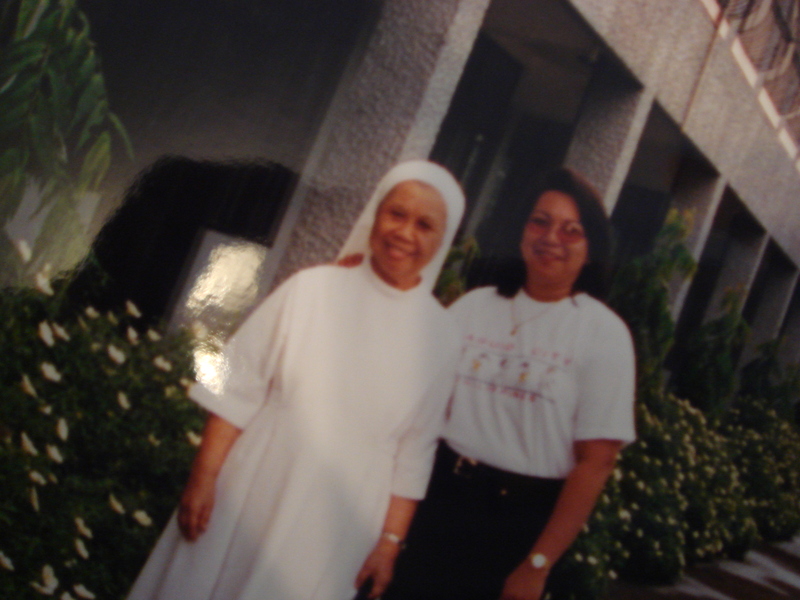 She used to be a vibrant person, a nurse and a Catholic nun, whose whole persona emanates a bright light that serves as a guide and inspiration to everybody. This special person, very dear to my heart, who played a salient role in my life: my guide, my inspiration, my role model…is now helpless and dependent with all her needs. 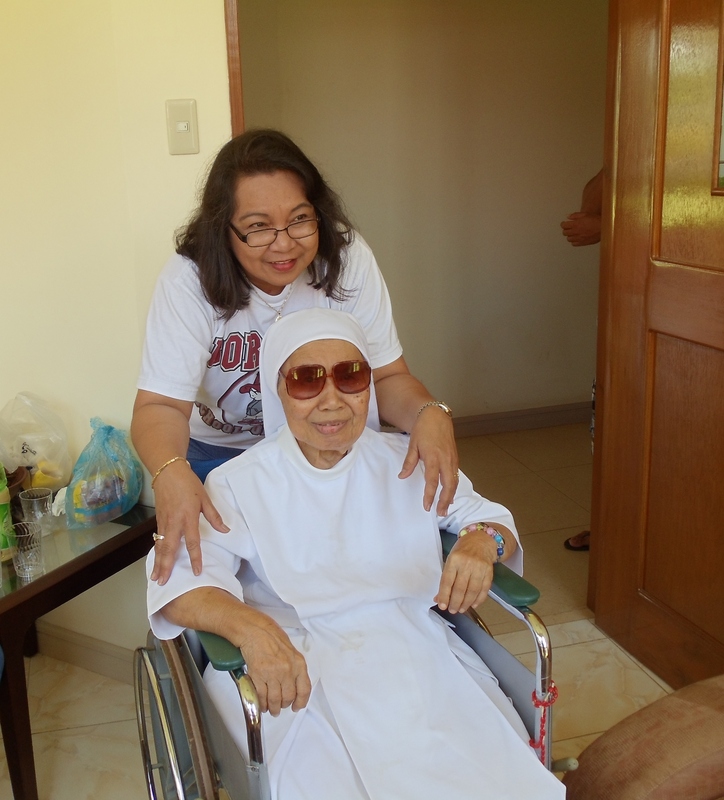 She is just so lucky that she is being tenderly cared for by her congregation, the Sisters of St.Paul de Chartres. And, she seems happy where she is now. Yes, indeed she is that “Tree”. The only tree that I know…so strong, so sturdy, so deeply rooted and nurtured by her Christian faith; a tree that looks at God all day. She had her time to spread her leafy arms, and cuddled the nest of robins in her hair. Because of her undying Love and Obedience, she is my Tree of Life. …and Good Morning To You, Too! Every single day, we just don’t know how every situation unfolds. Some days are good, some days are…not so good. As it is a common practice of courtesy in our facility, when we see a new face, be it a visitor or a family member standing in the front lobby seemingly waiting for something or somebody, we usually ask them “have you been helped?” so that we could direct them to where they want to go, or who they want to see. Almost often, we receive a positive response. A smile to express their gratitude, and the words “thank you” make our hearts burst with a sense of fulfillment, knowing that we are able to make their visit as wholesome as possible. This morning, was one of those not so good days. As part of my morning routine before going to our daily scheduled stand-up meeting, I made my initial rounds to check on our residents and staff. Everything was in order. No report of unusual incidents within the past 24 hours. When I passed by the front lobby, I saw two people, a man and a woman, sitting on the sofa. Both of them were dressed in formal clothes, as if they were on their way to a special gathering. With a nice smile and a cordial tone of voice, I approached them, and said our usual mantra: “Good morning. Have you been helped?” The woman looked at me, scanned my whole stature from head down to my feet, and answered: “Yes, we’re just waiting for my Mom. She’s being dressed up and getting ready. We’re picking her up to attend a funeral service”. I was glad that the staff took care of this important task of preparing our resident, and getting ready for their family occasion. But then…the mood of the day turned 180 degrees, when the lady added these words: “Make sure to let everybody know why we’re here, coz you are the fifth person who asked that!” I was taken off-guard, but still managed to smile, and answered: “Ok” then turned to walk away.